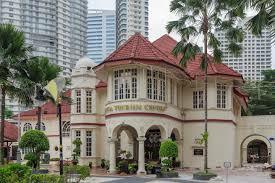 Listing private properties as heritage sites: the on-going Vivekanananda (Kuala Lumpur) case. And: where does Sarawak stand? The current saga for the preservation of the 110 years old Vivekananda Ashram, in Brickfields, Kuala Lumpur, is a good example of the obstacles that can be encountered in gazetting private properties as heritage sites. Just from the above photo, this site is undoubtedly a heritage asset, don’t you think? And on top of just the architectural value of this building it has historical value related to Indian immigration. The owners, a public limited company managed by a board of trustees, want to redevelop the site into a a 23-storey apartment tower and have opposed the attempt to list it twice. In late October 2015, Malaysia’s Minister of Tourism confirmed in Parliament that the Ashram will be gazetted as a heritage site under the Heritage Act 2005. “The decision is final”, he said, adding “there will be no form of development on the grounds of the ashram”. But, further to this, the media reported that the owners have filed a judicial review to quash the decision, arguing that only the building (or even, just its facade and the statue in front of it) should be protected, and that real estate development should be allowed in the immediate surroundings. The High Court initially set to Jan 13 2016 to hear an objection by the Attorney-General’s Chambers (AGC) but early January, media reported that the hearing is postponed to 12 February 2016. The outcome will be important for the heritage conservation community. This indeed makes the heritage listing of privately owned items more complicated than listing Government property. There is most of the time a strong trade-off between short term interests to use valuable land for development, and the preservation of cultural values with a long term perspective. But, because a sizeable part of buildings with heritage value is in private hands, a sensible heritage policy cannot set aside the issue of their protection just because it is more tricky. The decision making authorities need to stand firm in affirming heritage values. Where do we stand in Sarawak? Up to now only 18 historical sites, buildings or monuments are listed and gazetted (see the list in our page Reference Material). These are all Government-owned; to our understanding, no privately-owned building or monument or immovable item located on privately owned land has actually been gazetted. In 2007 and 2008, 40 additional items including some privately-owned buildings or sites were proposed but do not seem to have reached the gazetting stage. This may well be related to anticipation of issues of the kind faced by the Vivekananda Ashram. What does this all point to? To a need to offset the constraints imposed on the owners of listed built heritage by meaningful assistance for conservation : technical advice, financial assistance or even tax incentives. From a public policy point of view, such assistance is plainly justifiable: it supports a common good (heritage) that carries broader long term economic benefits. It can also enhance the market value of heritage listed properties, which is in itself an incentive to listing. Sarawak’s ordinance on cultural heritage allows such assistance to be developed through subsidiary regulations (**). And even in the absence of specific regulations, Government budget lines may be available for heritage projects (***). (*) It may be useful to recall that, upon listing, the ownership remains unchanged. Laws/regulations usually also provide for the possibility for the Authorities to acquire a site or monument under provisions ruling compulsory acquisition for public interest. Art. 21 of the Sarawak Cultural Heritage Ordinance 1993 allows for such possibility. (**) Sarawak , Sect. 35 : “The Minister may (…) make rules (…) [that] may provide for (…) (e) establishing a special fund to be employed for the purpose of defraying expenses for the maintenance, preservation or restoration of buildings, monuments or sites (…)“. The National Heritage Act (2005) has similar provisions : the owners of heritage sites may apply for grants or loans for conservation and preservation works. (#) photo from ‘Save Vivekananda Ashramam Brickfields’ Facebook page, accessed 27 11 2015. Next post Enforcement issues in George Town heritage management?